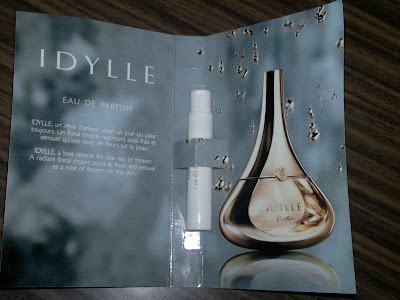 Today I am reviewing the Guerlain Idylle (Eau de Parfum) which was part of my blisscovered January box (shown here). 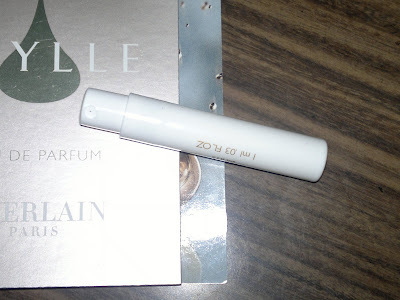 I got 1ml of the product in a smallest spray packaging, which I have ever laid my eyes upon. The packaging I felt is great carrying around in our handbags for an emergency or unplanned outings. What the website says: Idylle... Light and airy, an unforgettable love affair, an impulse, an ecstasy. It is waking up with a smile and going to sleep with a memory, it is a thousand details, words, kisses, it is ardour and intensity. It is the hand putting a drop of perfume behind your ear, your ear that strains, listens for the breath of a kiss. Idylle, a love dream by Guerlain. Since I was very eager to try it on, didn't wait for the special emergency to happen and used it over my anniversary weekend on my trip to watch Zangoora (discussed here). Personally, I liked Idylle. The perfume smells quiet strong sprayed initially, quiet strong for me as I am used to light, floral fragrances. I imagined this to be as well, but it is another story all together. Though it mellows down a little bit after 15 minutes, but it is not your sweety fruity floral fragrance. The fragrance is quiet heady and reminds me of exotic places and stories, such as, Arabian nights. The staying power of the perfume on me was around 6 hours, which I liked a lot. In this case, I would say a little goes a long way. Idylle smells luxury, makes you feel luxury, and is luxury epitomized. If you are planning on buying this be sure to try it on for a day before making up your mind. You might not like it on the first go but it is the sort of fragrance which envelopes you, surrounds you, and builds up on you. Also, price is a big consideration in this case, but since this is a luxury brand, the price seems right. Idylle is available on all Guerlain stores and online (via blisscovered). My product rating: B+, would have definitely purchased this if I could afford this. I love the small size perfumes,,you can always put them into your bag and use it whenever you feel so,,I have 3 4 of them but well they are in hard glass bottle.. Wish you a very happy republic day namita. thanks for liking the review. Great review. I love sample perfumes they come in handy. Hi, welcome to my blog. thanks for following. 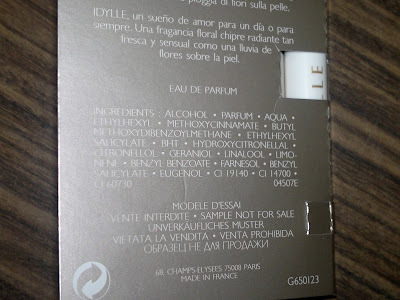 me love perfume samples more than full bottles as they are easy to carry around. its perfect travel size.... strong ones bother me i prefer sweet flowery fragrance... nice review! Hi Sangeetha, it's quiet strong initially but them mellows down a bit and then stays with you for the day.